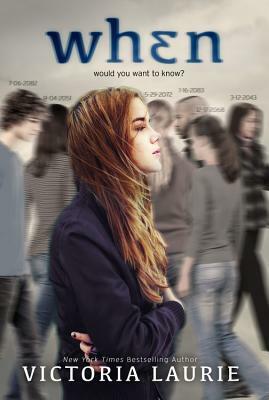 Maddie is a normal teenager with an eerie gift. She can read your “death date” on your forehead, and she is never wrong. The people in her community keep her at arm’s length until Maddie and her best friend, Stubby are implicated in a series of murders. Now the FBI is breathing down their necks and Maddie’s uncle/lawyer is doing all he can to clear their names. How could two harmless teenagers be behind these gruesome crimes? When by Victoria Laurie is a captivating story with a plot that gets thicker with every turn of the page. Maddie Fynn is a shy high school junior, cursed with an eerie intuitive ability: she sees a series of unique digits hovering above the foreheads of each person she encounters. Her earliest memories are marked by these numbers, but it takes her father's premature death for Maddie and her family to realize that these mysterious digits are actually deathdates, and just like birthdays, everyone has one. Forced by her alcoholic mother to use her ability to make extra money, Maddie identifies the quickly approaching deathdate of one client's young son, but because her ability only allows her to see the when and not the how, she's unable to offer any more insight. When the boy goes missing on that exact date, law enforcement turns to Maddie. Victoria Laurie is a New York Times bestselling adult mystery author and a former professional psychic intuitive. Both careers have served her beautifully in crafting her young adult debut, When. She lives and writes in Michigan.